The forgotten clown prince: Frank Kovacs. When we think of bad actors in tennis, the names usually come from the age of TV media--Ilie Nastasie, Jimmy Connors, John McEnroe, or currently, Nick Kyrgios. Perhaps we think back to Bobby Riggs who played the role of media clown during the run up to his loss to Billie Jean King in the so called battle of the sexes. But Frank Kovacs? The vast majority of tennis fans have never heard his name, much less the bizarre, disruptive and occasionally hilarious details of his antics during the era when Bobby Riggs was at the top of the game. Kovacs may be forgotten but in his era he was dubbed the original clown prince of tennis. Much like Art Larsen, whose charismatic personality and obsessive compulsive behavior are detailed by Gardnar Mulloy in his series Will To Win (Click Here), Frank Kovaks is a player lost in tennis history, supremely talented, but never a winner of a major title. 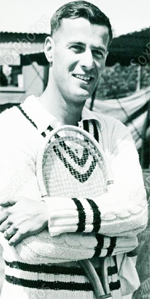 Instead he was a supporting actor in an era in which the quirks of the players were not subject to the 24 hours news cycle or even at times the discipline of the governing bodies in tennis. Few pictures of Kovacs survive and it is nostalgic to think of him as a forgotten man in a bye gone and magical era. But Kovac's career was closely intertwined with many other top players, some of whom openly despised him. No relationship was more intimate or consequential that his relationship with Bobby Riggs, as we will see. But before turning to Riggs, let's see the background and then describe Kovac's insane encounter with the great Gene Mako at Forest Hills in 1938.